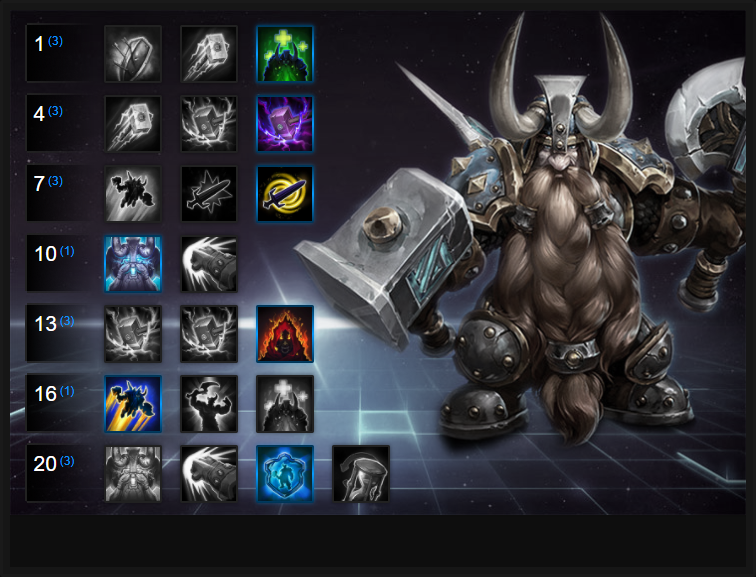 In this Muradin Build Guide, we provide an overview of his strengths, abilities and talents. Muradin is still one of the most reliable Warriors in Heroes of the Storm thanks to his mobility, stun, hardiness and health regeneration. He can comfortably charge into a group, deal damage and cause a nuisance before escaping with Dwarf Toss. Although he can take a fair amount of punishment, Muradin is still vulnerable to crowd control and if Dwarf Toss is on cooldown, you need to ensure you don't dive too deep or you'll quickly die. For the most part however, Muradin is a solid Warrior for any composition and besides Johanna, there are few that act as such a safe pick when it comes to "tanking". Second Wind (Trait) - allows Muradin to restore his health every second regardless of his current health. It's when he's low health (below 40%) that the amount he heals is doubled. This trait makes Muradin particularly hardy and when paired with Malfurion, it means he can heal for a fair amount. The only downside is that to trigger his trait, you have to have not taken damage. Unfortunately this means it mainly activates when you're running away, or between lanes when you've left a fight. It can be particularly useful however if you manage to kite a melee Hero, only to regain health and then dive back into combat. Storm Bolt (Q) - Storm Bolt allows Muradin to stun a single enemy and as a base Quest ability, it can be significantly improved every time Muradin lands his stun. Muradin needs to hit 20 enemy Heroes in order to obtain the piercing/cooldown reward, so it's in your best interests to use Storm Bolt as often as humanly possible in order to lock players down and complete your Quest. Thunder Clap (W) - Muradin's best method of wave clearing minions, Thunder Clap slows enemies by 25% and deals damage. I'd recommend you always use it after Dwarf Toss or when in amongst the enemy so that enemies near you are slowed. If you can, stun them as well with Storm Bolt so they take prolonged damage in the field (once Thunder Clap is talented). Dwarf Toss (E) - allows Muradin to leap through the air and deal damage to enemies on landing. It's great for engaging in combat but it's invaluable for escaping. If you can run into a fight, rather than use it, do so. You're then gaurenteed to escape when needed. Be aware that Dwarf Toss no longer causes Invulnerability for Muradin while he's in the air, so you need to ensure you aren't affected by crowd control to use it. Avatar (R) - is Muradin's best Ultimate ability as it provides him with a huge boost to health and allows him gain tons of survivability in the process. Unsurprisingly, the entire purpose of Avatar is to make Muradin as tanky as possible and if paired with a healer, he can be a huge nuisance at not only body blocking but also taking blows for his team. Just be sure to use Avatar when you need it, rather than early in a fight - it'll ensure you get maximum use from it. Haymaker (R) - If you've another damage dealer on your team, Haymaker can be valuable because it not only deals huge damage but removes someone from the fight due to the distance it knocks them. Although it can be used offensively (as it should be) it's also incredibly useful to use defensively if a Hero such as The Butcher or Illidan are on your healer. I will add that Haymaker obviously makes Muradin much more vulnerable, as he lacks the survivability of not taking Avatar. Despite that, it can be particularly useful for turning any fight in your favor: removing a player is always useful. Third Wind is a simple talent but one that's incredibly effective. It increases the amount you heal from your trait but also increases the threshold of when it activates from 40% to 60%, providing much needed sustain much earlier. Variable: As a front-line Tank, it's absolutely paramount that you obtain as many means of mitigation as possible. Block is invaluable against just about every Hero and considering it holds 2 charges and reduces incoming basic attack damage by 75%, that's a significant boost to your survivability. Skull Cracker allows Muradin to stun briefly every 3rd basic attack. In addition, he also gains increased bonus damage (60%) allowing him to land far stronger attacks. Variable: Give Em' The Axe allows Muradin to pursue a damage orientated build. Allowing his basic attacks to deal 50% increased damage for 3 seconds against stunned, slowed or rooted targets ensures he can apply massive pressure very quickly (especially when using Stormbolt and Thunderclap rotations). A huge health boost combined that also allows you to make use of your basic abilities is hard to pass up. Even though the Ultimate ability offers little extra utility, Avatar's health bonus is significant and provides you with tons of survivability and allows you to body block easily. Bronzebeard Rage allows Muradin to deal minor AOE damage at all times to enemies around him. When he then applies a slow, stun or root to said enemies, the damage of this AOE is increased by 100% for 3 seconds. It's a significant boost and allows Muradin to seriously pressure squishy enemies. By default Dwarf Toss doesn't leap Muradin very far, so taking Dwarf Launch, which increases your Dwarf Toss leap distance by 40%, is significant. Not only this, but Dwarf Launch reduces the cooldown of Dwarf Toss by 3 seconds when you hit an enemy Hero, allowing you to use it every 7 seconds. If you're taking loads of punishment, Hardened Shield is a good alternative as you can use it with Avatar for a huge boost to your defence. Variable: A very good talent for Muradin, Rewind provides you with two of everything which is incredible for escaping and attacking enemy Heroes. Double stun, Dwarf Toss or Thunder Clap is incredible. These Hero Threat Levels (1 being lowest threat and 10 being highest threat) are to help you determine which enemy Heroes can give you a headache. Any Heroes that aren't on this list are easy pickings for Muradin. If a Hero is listed here, take greater. Johanna: Her survivability combined with her slow, pull and elite stun make her really difficult for Muradin to deal with. She's a good counter. Brightwing: Although he's never going to kill you, Brightwing is particularly strong against Muradin due to her ability to Polymorph you and make your Avatar redundant. The Butcher: His charge, Lamb to the Slaughter or self heal can rip you up in seconds. Even if you stun him, a good Butcher will have saved his Lamb to the Slaughter to ensure you can't use Dwarf Toss to escape. Xul: His Bone Prison when talented to cause Vulnerability is a real problem for Muradin now as he can no longer dive out of it and prevent the root. This list of tips and tricks are just a handful of things we think will help your Muradin play. We'll continue to add to the list as required and if you have any tips you'd like to share, let us know in the comments below and we'll place them here. 1. Always try to run into a fight rather than using Dwarf Toss as you'll then be free to make a clean exit if you need to. 2. Try to always save Storm Bolt for Heroes that have powerful channeling abilities such as Malfurion's Tranqulity or Lili's Jug of 1000 Cups as it'll stop the skill entirely. 3. Use Thunder Clap to clear waves of minions by gathering them close together. 4. If you can, always try to hit two targets with Storm Bolt for maximum impact and if you've got rewind, hit them again. 5. Avatar is incredible during a team fight but you still rely on your team to back you up. Use the stun to constantly interrupt the highest damage dealer or the enemy healer. 6. Muradin is, like most warriors, good at body blocking. Make use of this when someone is trying to escape. 7. During early game Muradin is great at roaming lanes as he can comfortably gank enemies with his stun. Capitalize on this as soon as you can. 8. Later game with Rewind you can comfortably use Dwarf Toss > Storm Bolt > Thunder Clap > Rewind for a huge damage burst and still have a full set of skills ready to go again. 9. Remember your Trait only activates when you're out of combat for 4 seconds. It's best for when escaping.